Have you ever felt so confident of who you are in Christ Jesus, but then a situation happens that causes you to question your confidence? A similar situation happened to me one night after I returned home from work. Something so simple happened on the job which really hadn’t bothered me…until I got home. As I replayed the events of my day, the enemy reminded me of the rejection I felt on my last job in federal government. I was reminded of the years of torment I endured from my manager and how I allowed it to effect my performance for years, until I determined I was working as unto the Lord instead of my manager. One simple task that I didn’t accomplish on my job caused me to rethink my past and get overwhelmed and flooded with emotions. I said a simple prayer and went to bed. The next morning, I was determined to not be in a funk, so I did what I know works for me…put on some praise and worship music. As I sang myself into a better disposition, the words of one of the songs really pierced my heart. The title of the song is “Still Believe” by Kim Walker-Smith. In the song, she sings of the power in the blood of Jesus. As I continued to sing, I was reminded the blood “is the same yesterday, today, and forever”. When hearing or singing about the blood of Jesus, many automatically refer to its miraculous, healing power. However, while singing I heard a small voice reminding me “I am an overcomer by the blood of the Lamb and the power of my testimony”. And as always, the waterworks began. But this time, it wasn’t because I was sorrowful. I cried because I thanked God for revealing to me who I am in Him by the blood of Jesus Christ. His Blood is the same, yesterday, today and forever. His Blood continues and will continue to cause me to overcome and triumph, even in the midst of adversity and trials. His Blood continuously washes me from all of my sins. His Blood heals me from all sickness, iniquity, and disease. As the old hymnal says, “There is power, power, wonder working power in the precious blood of the Lamb”. I am so grateful for the shed blood of Jesus. There is so much more to His blood than we could ever imagine! One of the most powerful verses in the song “Still Believe” is so simple, yet packs a powerful punch to my spirit. It simply says “I still believe your Blood is sufficient for me”. Jesus’ Blood is all sufficient for everything we encounter in life. These verses of scripture remind me that the enemy, the accuser of the brethren, will attempt to make me lose focus and dwell on past failures, pain, and rejections. However, from this time on, I will remember the power of the blood to overcome. I pray you will too. To watch Kim Walker-Smith perform “Still Believe”, please click on the video below or copy and paste link into your web browser. O the Power of his blood! Our confidence is in His righteousness, not our own! Thanks for the blog and LOVE the picture. Yes and Amen, Sue! Good reminder that our confidence is in His righteousness. Thanks for commenting. Blessings to you! 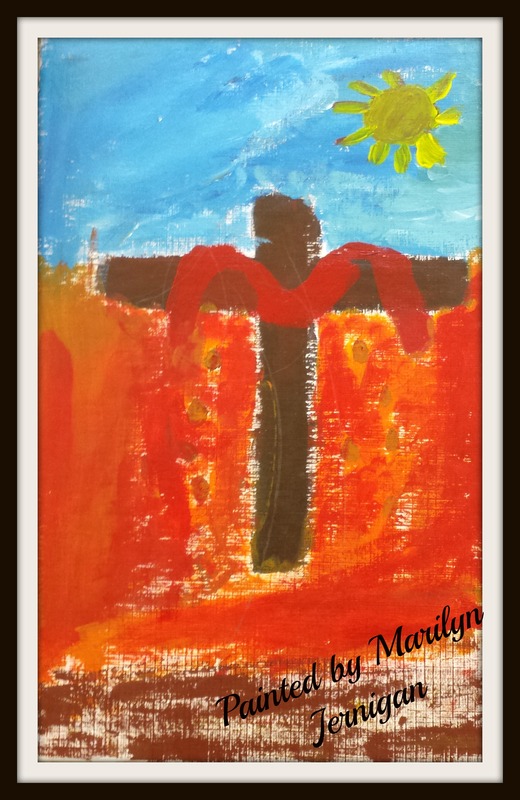 Marilyn thank you for this lovely reminder about the power of the Blood of our Saviour! It’s so amazing that every time you hear a message on the Blood, you always get another fresh revelation! Always cleansing and speaking better things on our behalf. Blessings and more my sister! I was able to relate to your post because when I’m facing challenges, my confidence is tampered. I too, have to remind myself that God chose me to do His will, and my assignment isn’t completed. The enemy enjoys creeping in at our lowest point with confusion. I’m so grateful for the blood because we have a fixed fight and always win. Antoinette, I love how you stated “we have a fixed fight”. Amen! Also thank you for commenting on my painting. It was my very first painting which made me realize painting is a fun thing to do as hobby. Thanks for stopping by. God bless you! Thanks Marilyn for the encouragement. Remain blessed. Thanks Bis for reading and supporting my blog. Many blessings to you! Hi Marilyn! That evil will grab on to anything he can to just make you feel helpless and terrible all at the same time! The same things used to happen to me at work too. I because so worried about mistakes, it made me crazy. I really think it was evil working on me big time. He knows my weakness and jumps for it any time he can. But that blood, oh yes, there is power there. And you are washed and loved at every moment of your life. That’s where your true glory is. Amen. Powerful one today sister. Preach it! Ceil, thank you for such kind and powerful words of encouragement. I agree that my “true glory” is in the blood of Jesus! Amen! That ole enemy doesn’t stand a chance against the blood. Many blessing to you!